In this interview, Colonial Coin Collectors Club president Ray Williams talks about early American coins. Along the way he looks at the differences between type and die-variety collecting and explains how the first mints were designed to be moneymaking ventures in more ways than one. Williams can be contacted via www.colonialcoins.org. I started collecting coins at age 11 when I earned a Boy Scout Coin Collecting Merit Badge. I collected cents, nickels, and dimes, placing them in the blue Whitman folders. Like most other boys in the late ’60s, I got interested in girls and cars, and then I went to college. I had been married for a few years before I dusted off my Whitman folders and tried to fill in the remaining holes, like the 1909-S V.D.B. cent, the 1914-D cent, and the 1955 Double Die cent. After completing my Lincoln cents, I tackled collecting Indian Head cents. Once I had completed that folder, I started a Large Cents collection, for which I completed a date set from 1793 to 1857. While I was actively seeking different die varieties for Large Cents, I gained experience with colonial coins through my involvement with an estate. Colonials were fascinating! I was installed as president of the Colonial Coin Collectors Club, or C4, at the summer American Numismatic Association (ANA) convention in July of 2000 in Philadelphia. I’m very proud to be president of C4. The members really love their coins and history. They enjoy learning and sharing information about the people who made the coins, the minting techniques, and where the metal came from. They’re fascinated by the science of coins—die emission sequence, die-state analysis, and other related research areas. C4 is a national specialty coin club and also an ANA member. We have members from across the U.S., as well as Canada, England, and Ireland. We don’t have an actual office as such, but we’ve held an annual convention for the past 15 years, generally in Boston during the month of November. Collectors Weekly: What is the definition of a colonial coin? Williams: Technically, we call any coinage that circulated in the British American colonies a “colonial coin,” but most of the collectors of colonial coins collect coins that circulated before the U.S. Mint started production in 1792 in Philadelphia. The Articles of Confederation governed us until the Constitution was ratified in 1788 and made us what we are today—The United States of America. 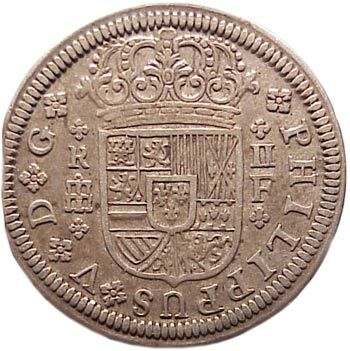 Top: The Obverse of a 1723 Pistareen, minted in Segovia Spain. Pistareens and all Spanish silver coinage played an important part in the U.S. colonial economy. Above: The reverse of a 1723 Pistareen. During the Confederation period, from 1783 until 1787, the 13 states had the right to mint their own coinage. The states taking advantage of this were Connecticut, Massachusetts, New Jersey, and Vermont. Vermont was not a state at the time, but we consider it as such for collecting purposes. We include the copper coinage of these four states under the heading colonial coins, even though they weren’t colonies at the time. The Articles of Confederation recognized these states as having the right to make their own coinage, but the Constitution put an end to that, making the Federal Government responsible for coinage. I enjoy collecting colonial coins because each coin was made from hand-engraved dies—no two are alike. Because of this, we have more than 140 different die varieties of New Jersey coppers that can be collected. One die looks obviously different from another, even though they had the same basic design. For example, the positioning of the central device with respect to the legend is different, spacing of letters and numbers. In some cases there are obvious spelling mistakes, all of which makes collecting varieties so much fun. Collectors Weekly: How far back do you collect? Williams: I have a couple of ancient Greek coins from around 400 B.C., but my main collection starts in 1575 with the Lion dollar, a Dutch coinage. The seven provinces and a couple of city-states issued them in Europe. They were really the trade coinage of the world until the Spanish eight Reales took over. I’m sure some Daaldes saw circulation in New Amsterdam (Manhattan) during the Dutch occupation and well into the British occupation. At that time, you had the Dutch colony in New Amsterdam, and we had the British up in Boston, Rhode Island, Connecticut, and down in the Jamestown and Williamsburg settlements in Virginia. The Dutch Colony of New Amsterdam survived a relatively short time before being turned over to the British. Collectors Weekly: Do you specialize in a specific type of colonial coin? Williams: I specialize in collecting New Jersey coppers by die variety. I also enjoy collecting colonial type coins that are within my budget. The coin on the left is a New Jersey copper, worth 1/15th of a shilling. The coin on the right is a Massachusetts cent. New Jersey coppers have more than 140 die varieties. That’s a combination of 80 or more obverses and 50 or 60 reverses. One reverse could be combined with maybe six or more different obverses. So there are about 145 pairings of obverse and reverse to collect. Many are unique or prohibitively rare, but the search never ends. This is the life of a die variety collector. Type collecting is a more general method of acquiring coins. A type collector might only want to obtain a dozen major varieties of New Jersey coppers, a dozen from Connecticut, plus some silver coinage from Maryland, Massachusetts, and foreign countries. When you collect by type, you set a goal as to how far you want to get involved. Collecting by die varieties isn’t for the faint of heart. It can be expensive and in many cases impossible because there are more than 140 different die varieties of New Jersey coppers, many of which are unique. In some cases only one is known to exist, and it might be in a private collection or a museum. The great collections of New Jersey coppers that have gone to auction have had anywhere from 80 to 110 different die varieties in them. Collectors Weekly: Are many colonial coins still available? Williams: There are about 400 C4 members who collect these coins. The most common colonial coin is still very scarce and rare if you consider the quantity still in existence. The most common colonial coin is a Rarity 1, meaning there are more than a thousand still known to exist. If you look at a scarce Lincoln cent, like the 1909-S V.D.B., it’s considered rare, but there are still probably 10,000 of them. At any point in time, I can open up the pages of “Coin World” and find a 1909-S V.D.B. for sale—all I need is a credit card to add it to my collection. Colonial collectors need to look through dealer cases at shows, bid at auction, purchase from other collectors. It takes patience. A scarcer colonial might be a Rarity 6 where there are between 13 and 30 examples known to exist. The very rare varieties will take even more patience and money, and you might need to wait for a friend’s estate to even have the opportunity to bid on a coin. That’s how rare colonials are. Metal detectorists uncover coins every day, including colonials, but not necessarily in the best condition. I know someone who’s doing a study on New Jersey coppers found by metal detectors. He’s located more than 300 of them that have been dug up over the past decade. So the numbers are slowly increasing. Collectors Weekly: How important is condition for such a rare type of coin? Williams: Very few colonial collectors are in a financial position to collect uncirculated coins. They’re rare and expensive. In some cases, the finest known example may be in a poor state of preservation. I think most of us collect coins that are in Fine to Very Fine condition. You have to purchase the rare coins in the most affordable condition you can. If there are only five or ten examples of a particular coin, you might have to accept it with major defects. It will still be expensive. Collectors Weekly: Did each colony make its own coins? 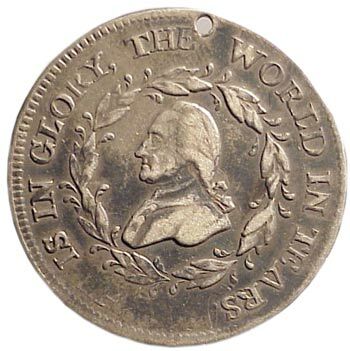 Williams: After we won the Revolutionary War, all the states had the ability to make their own coins, but the only ones that actually did were New Jersey, Connecticut, Vermont, and Massachusetts. Massachusetts produced the very first coinage to have the word “CENT” and “HALF CENT” in the design. In 1652, Great Britain didn’t have a king—Charles I had been executed and Oliver Cromwell was in office. At that time, the Boston Bay Colony started producing the Massachusetts silver coins. John Hull and Robert Sanderson started making those in 1652. They continued making them with that date for another 30 years. This was the first coinage made in North America. 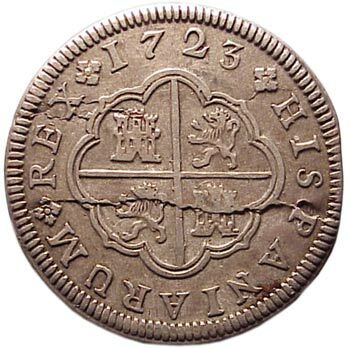 In the tobacco colonies, people would cut coins such as this 1723 Pistareen into quarters or halves to make small change. Before the state coinages, we used pretty much anything in circulation that we could get our hands on. Most of it was Spanish coinage. Although Great Britain wanted the colonies to pay their taxes in silver and gold, they wouldn’t send silver and gold to the colonies in exchange for the materials we were exporting. So we had to get silver and gold through trade with Spain, Portugal, and France, among other countries. In commerce, merchants would often weigh the silver and the gold coins to make sure they were of good weight, and issue change accordingly, sometimes cutting the coins to make small change. It wasn’t easy to make commercial transactions during colonial times. They didn’t have cents, nickels, and dimes like we have today. Merchants had a mix—schillings, pence, Reales— and they had to give change. Making change for all the different foreign coinages was a complex procedure and contemporary almanacs gave the exchange rates of the day. Collectors Weekly: Why was it so important for the colonies to produce their own coins? Williams: It was a sign of authority. Being newly freed, the states wanted to show their authority over the people within that state and in commerce by issuing their own money. Also, the legislation would regulate the state’s coinage and hopefully force out of circulation the vast amounts of counterfeit British halfpence circulating at the time. Those involved in the mints felt that it would be a good moneymaking venture, a means to get rich. This was generally not the case. As a matter of fact, a number of people involved with the mints ended up in debtors’ prison or fled the country. There was a lack of good circulating small change in the colonies, so by making your own, you had what was recognized as good money for small change. 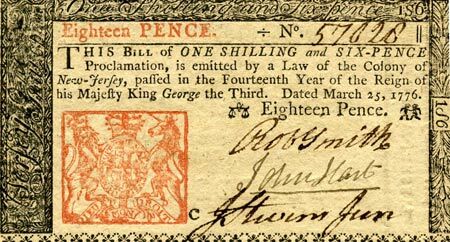 Collectors Weekly: Do people collect shillings and pence? Williams: Yes. Some colonial collectors do collect the issues of England at the time—both Regal and counterfeit—as part of colonial coins. I’m trying to get a shilling from each one of the monarchs from the time of the Jamestown settlement until George III ended the Revolutionary War. Anything that circulated within the colonies could be collected. There are many different ways to collect colonial coins, including collecting these foreign coins that circulated during our colonial times. Collectors Weekly: How were the state coins different from what was already in circulation? Williams: At that time, the states only made copper coins, not silver ones. The silver and gold coins circulating were still the same foreign coins. As a matter of fact, foreign coins were legal tender in the United States until 1857. At that point, the government felt the mint was able to produce enough coinage to serve the needs of commerce in our expanding country. 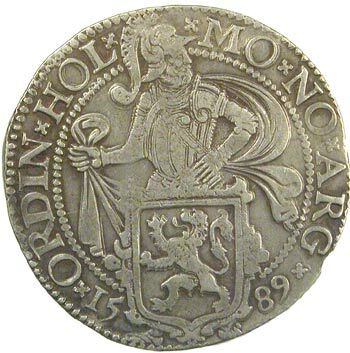 The obverse of a 1589 Lion Daalde. Coins like this circulated freely in New Amsterdam. That’s one reason why the Flying Eagle cent was minted. It was much smaller than the large cents produced earlier. You could redeem Spanish silver coins for them. Then the Spanish silver would be melted and made into our own silver dollars, half dollars, quarters, and dimes. The mint in Philadelphia opened in 1792, but it and its branch mints didn’t produce enough coinage to supply our country until 1857. Up until that point, our own silver coins mixed freely in commerce with foreign silver and gold coins. Massachusetts made its mint a state mint. Massachusetts hired its own die engravers and people to strike the coins. Connecticut, Vermont, and New Jersey contracted the work to individuals. The minters for Connecticut, Vermont, and New Jersey were also given performance bonds and had to pay their states a percentage of their production. For example, the New Jersey mints had to pay the state 10 percent of the coins they minted. The two mints were authorized to produce a total mintage of three million copper coins. Of the three million, 10 percent had to be paid quarterly to the state for the little more than two years that they were striking the coins. After you subtracted the costs for the copper, die-production, the labor to strike the coins, the 10 percent you had to pay the state, rent, and other expenses, whatever was left over was the mint’s profit. Not surprisingly, most of the mints lost money. These people were entrepreneurs who were trying to make money, but when they started doing the work, buying the materials, purchasing the equipment, engraving the dies, paying day laborers—I think they also probably used slaves in the process—it just became uneconomical. The U.S. Mint in Philadelphia tried to hire Albion Cox, one of the minters of New Jersey coinage, as its first assayer in 1793. Cox had fled to England because he was in debt. He was apprehensive about coming back to the U.S. for fear of ending up back in debtor’s prison, so the mint promised to find a way for him to pay off his debts. He returned and became the first Assayer of the U.S. Mint. Walter Mould, who operated the mint in Morristown, New Jersey, fled to Ohio to escape creditors. This was a common situation with the mints. Collectors Weekly: So does early colonial also mean early American? The obverse (left) and reverse (right) of a 1773 Virginia halfpenny. Williams: It depends on your definition of colonial. Everything in North, Central, and South America is American. You had British American colonies, which is what we associate ourselves with because we now speak English, but the Spanish, Swedish, German, and Dutch also colonized America. Early American would be everything before we were the United States. Early American coinage would be the federal coinage from 1792 until probably 1836, when a steam press was installed in the U.S. mint and they could make coinage in a more modern manner. Before 1836 all the coins were struck on screw presses. It was a hand operation—manual labor, horses. With the steam press, they could probably put out 10 to 20 times the amount of coins as with a screw press in the same amount of time. That’s probably the beginning of modern American coinage. Collectors Weekly: How were the coins circulated? Williams: They circulated primarily in the state where they were made, but they did go outside of those states. I found a Connecticut copper in New Jersey with a metal detector. I know of New Jersey coppers that have been found in probably 10 different states. Of the 13 colonies, which turned into the 13 states, only three made copper coins: Massachusetts, Connecticut, and New Jersey. During the Confederation period, the 13 states had the authorization to strike their own coinage. There were 10 states that were not striking their own coinage. For instance, New York did not strike its own coinage. They had proposals made by various individuals and firms to strike coinage for the state, but the state decided instead to use and regulate whatever was already in circulation. Collectors Weekly: What was on the coins themselves? Williams: It was different by state. For New Jersey coppers, the obverse had a horse’s head with a plough underneath, along with the date and the Latin legend “NOVA CÆSAREA.” On the reverse of the coin was a shield with the legend “E PLURIBUS UNUM.” This was the first time our national motto was placed on a coin—it was a 1786 New Jersey copper. The reverse of the Lion Daalde (its obverse is shown above) depicts the animal that gives the coin its name. The New Jersey copper is unusual because the obverse design is more of a state theme while the reverse is more of a federal design. The obverse has a horse head and a plough below, the date at the bottom and the legend NOVA CÆSAREA surrounding the entire design. We were a farming community. The name NOVA CÆSAREA was actually in the original land grant to Sir George Carteret from Charles I—that’s what he called New Jersey. It’s a Latinized version of New Caesar, which was named after the Isle of Jersey off the coast of England. The reverse of the New Jersey copper was more of a federal type of design, with a federal shield and the motto E PLURIBUS UNUM. 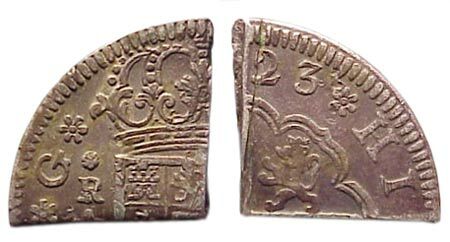 The Connecticut copper was similar in design to the British half pennies at the time. It had a bust on the obverse of the coin, which oftentimes looked like George III. On the reverse they had a seated figure that looked like Britannia but was really Miss Liberty. I think they chose the bust so that it would look like the regal half pennies and be accepted in circulation. The obverse legend was “AUCTORI CONNEC” around the bust. It’s a Latin abbreviation for “by the authority of Connecticut.” “INDE ET LIB,” which is short for independence and liberty, was on the reverse. These Connecticut coppers were made from 1785 to 1788. New Jersey coppers were made from 1786 until 1788. The obverse of Massachusetts coins have an Indian holding a bow in one hand and an arrow in the other with the word “COMMOMWEALTH.” They didn’t use a Latin legend. On the reverse, there’s an eagle, dead center, holding arrows in one claw and an olive branch in the other with MASSACHUSSETTS as the legend and the date underneath. The eagle has a shield at its bust that gives the denomination of Cent or Half Cent. On the reverse of the Landscape design there is an all-seeing eye in the center with rays shooting from it, surrounded by the legend: “STELLA QUARTA DECIMA.” That’s Latin for the 14th star, an indication that Vermont wanted to be the 14th state. I don’t think these circulated well because the public was accustomed to seeing a bust on the obverse and a seated figure on the reverse on the British copper coinages. In 1786 Vermont started making coins that looked very similar to the British halfpenny and Connecticut copper, which had the bust on the obverse and a seated figure on the reverse. The bust obverse had the legend “VERMON AUCTORI” and the reverse had the same legend as the Connecticut coppers, “INDE ET LIB.” Vermont struck these copper coins through 1788. Collectors Weekly: How were the images for the coins chosen? Williams: The states passed legislation that would authorize the coinage to be produced and also specified designs to be used. 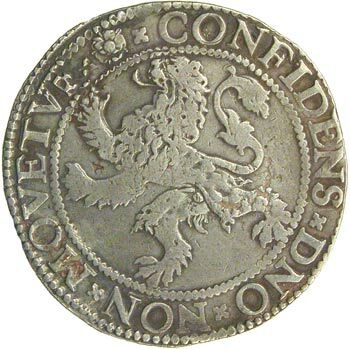 I believe the thinking of Connecticut and Vermont was to have coinages that looked very similar to the British halfpence that had been in circulation for decades. In doing this, the hope was that they would be more readily received in circulation. New Jersey and Massachusetts differed in their approach by selecting design elements from their respective state seals to be placed on their coins. In the late 1780s, a copper panic occurred and the value of all copper coins started dropping. Originally, New Jersey coppers were valued at 15 to the shilling. As the copper panic progressed, New Jersey coppers dropped to 20 to the shilling, then 25, then further. While this drop was taking place, the New Jersey coppers held their value better than all other coppers because they were receivable in paying New Jersey taxes. The copper panic ended about the time the Philadelphia mint started and then we got on a firm copper basis again. Collecting colonial coins is not a hobby where you just fill in the holes in a book. You can hold pieces of history in your hand and learn about the people who made them, who spent them, who legislated them, and all the controversies and politics of the time. Collectors Weekly: Did different coins have different names? Williams: Connecticut, Vermont, and New Jersey coins were called coppers. The Massachusetts coins were called cents and half cents. The reason the first three weren’t called anything but coppers is because they were accepted at a certain rate. So 1/15th of a shilling was a New Jersey copper’s actual value. It wasn’t a cent, and it wasn’t a half penny because 24 half pennies would equal a schilling, but 15 New Jersey coppers were legislated to be valued at a shilling. It was a totally new coinage. They didn’t actually have a name for it. Colonial coinage was an imperfect art, as these coppers from Connecticut (left) and Vermont (right) clearly show. The U.S. economy wasn’t standardized until we placed the Philadelphia Mint into operation. Even with the U.S. Mint, it still took another 65 years before the coinage production was sufficient to meet the commercial needs of our expanding country. Today you can still sometimes hear people referring to a quarter as “two bits”, which is a Spanish two-Reale coin that goes back to our colonial times. A decade ago, the stock exchange actually traded in eighths of a dollar instead of tenths. This was because the stock market was formed at a time period in the 1700s on Wall Street when they were using Spanish eight-Reale coins. Stocks were all valued to an eighth of a dollar until relatively recently. During our colonial time, many of the very early settlers had little use for money. Transactions were made between the colonists and Native Americans using a barter system. Just about anything of use could be obtained by exchanging what you had for what you needed. Common items used in barter and trade included animal skins, corn, tobacco, musket balls, chickens—just about anything that was grown or made here was a commodity. I actually collect that, too. I have musket balls I’ve found from colonial sites with a metal detector. I have tobacco both in leaf form and knots, real wampum that was used by Native Americans, as well as Indian trade beads and trade silver. I’ve collected Dutch Lion dollars and Spanish, Swedish, and British coins that circulated in the colonies. Collectors Weekly: So you’ve actually found coins with a metal detector? Williams: It takes luck and skill to find colonial coins. I’ve found a number of New Jersey coppers and Connecticut coppers, Spanish silver coins, and some old copper coins. I once found a Spanish silver coin that had been cut into one quarter. People often lacked small change in the tobacco colonies around Maryland, Virginia, and the Carolinas, so they would take a Pistareen, which is about the size of a modern American quarter, and cut it with a chisel into halves and quarters to make small change. I found one quarter of a 1723 two-Reale coin with a metal detector in Virginia. When the mint opened, these coins continued to circulate. I have a document that shows that New Jersey coppers could still be found in circulation into the 1870s, but the mint was collecting them and melting them down to create federal coinage. Nowadays, if you came across a Mercury dime, you’d probably put it in your jewelry box and keep it. In the 1800s, people did the same thing with colonial coins. The Mint started its first year striking only the cents and half cents. No silver or gold coins were struck in 1793 because of the excessive bond required to get started. This was remedied in 1794. I guess, technically, Washington gave the mint silver in 1792 to make dimes and half dimes, but those didn’t really get into circulation. They were given out as curiosity items and souvenirs. 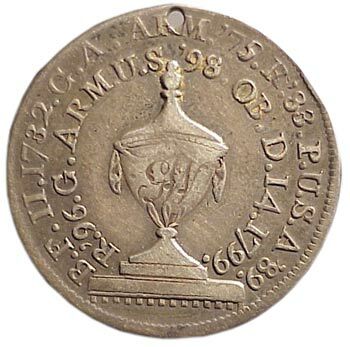 Some made it into circulation, but for general circulation, precious metal coins weren’t made until 1794. Collectors Weekly: How did the denominations of colonial coins vary? The obverse of a Washington Funeral Medal. Pieces like this one were struck and sold by Jacob Perkins in Boston for the two funeral processions held there in 1800. Williams: The cents and half cents from Massachusetts were their own denominations. The other coins, the coppers, were accepted at different values in commerce. In 1786, New Jersey coppers were accepted at 15 to the schilling and Connecticut coppers were accepted at 18 to the schilling. So one New Jersey copper was worth more than one Connecticut copper. That was because New Jersey coppers were acceptable payment for state government taxes. That wasn’t the case for coinage from other states. Some entrepreneurs actually started striking Connecticut coppers and British half pennies with New Jersey dies. If you take a Connecticut copper that’s worth 18 to the schilling and strike it with a New Jersey die, it becomes worth 15 to the schilling. One stroke in the screw press and you’ve made some pretty quick money. You didn’t have to make the planchet, roll the copper, cut the planchet, anneal the planchet, and then strike it. All you had to do was heat the Connecticut copper a little to soften it and then strike it. There were other schemes, too. Take the legislation for the New Jersey coppers: Matthias Ogden was a Revolutionary War hero who tried to promote a state coinage in early 1786. One of the politicians who voted it down was Daniel Marsh from Rahway, New Jersey. Marsh later changed his vote and the coinage was approved. The coining process ended up being done at Marsh’s mills in Rahway, where Marsh collected a handsome rental fee. He changed his vote for personal financial gain. Collectors Weekly: What did the dies determine? The reverse of the Washington Funeral Medal shown above. Any colonial coin related to Washington is very collectible. Williams: A die is what puts the coin’s design on the planchet. In a screw press, you have an obverse die and a reverse die, one attached to the screw and the other attached to the anvil. Placing a planchet between the dies, the screw would be turned with a big lever, exerting tremendous pressure. The designs on the two dies would be transferred to the blank planchet and you would have a coin. Each one of those dies was handmade, so no two were alike. In die-variety collecting you try to get an example of every combination of obverse die and reverse die. There’s no specific reason why they mixed and matched certain dies. Sometimes during maintenance they’d take the dies out, re-grease the screw press—it was an expensive piece of equipment—and then put dies back in. The minters grabbed any obverse and reverse dies off the shelf, reinstalled them, and struck coins until it was time for maintenance again. Dies were used until they broke, and sometimes even after. Some broken or worn dies were re-engraved and strengthened to extend their operating life. The die engraver would soften the steel, re-engrave some features, re-harden it, and then put it back into service because die steel was very scarce and expensive. You didn’t throw it away unless you had to. The colonial mints weren’t making these coins for collectors. They’d just put out as many coins as they could to make money for themselves, supply commerce, and pay the commissions they had to pay to each of the states. This was strictly a business operation. Collectors Weekly: When the Philadelphia mint came online, did coins become more consistent? Williams: Yes. The U.S. Mint kept a much stricter standard on the coinages than the colonial mints or the state copper mints. A fulltime assayer was on staff and legislation determined how much each coin should weigh. Later, the Mint had to make changes when the silver in the coin became worth more than its face value. Many of these earlier coins were taken out of circulation and melted down for their silver content or sent overseas to be melted for their silver or gold value. The mint had to be precise with their coinages because the silver and gold coins had close to their full value in metal in them. Copper coins were just a token coinage—they were accepted for whatever amount they would trade at. A silver quarter had pretty close to a quarter’s worth of silver in it. If the value of silver went up, then someone would melt the coin and make a profit on the silver. Collectors Weekly: What are some of your favorite coins in your collection? Williams: My favorite coin in my collection is a Maris 3-C. The Maris 3 is a die designation for an obverse of a 1786 Immunis Columbia. The Maris C is a designation for the New Jersey copper C reverse. That’s probably my favorite coin because there’s a lot we don’t know about it. It’s a rarity 6—there are probably 15 of them known to exist. Friends have made offers to obtain it from me, but it’s difficult to part with your favorite coin. We don’t know why the Maris 3-C exists. It’s likely that it is a pattern coinage, struck as an example of workmanship and shown with proposals for a private contractor attempting to get the contract for producing our federal coinage. The U.S. determined not to contract our coinage but to set up its own mint facility. The full story is probably out there, but it’s buried in some state archives, in a college library, or maybe in someone’s diary. Some other colonial coins have names. There’s the Baby Head, which is a Vermont coin. There’s a Massachusetts coin known as the Transposed Arrows, a Connecticut coin known as the Muttonhead, a New Jersey copper known as the Deer Head, and another New Jersey coin known as the Camel Head. There are dozens of colonials that collectors have given fanciful names over the last 160 years. Collectors Weekly: What books do you recommend for someone new to collecting colonial coins? Williams: A lot of people forget about the Red Book, which has been published by Whitman since the 1940s. It’s updated annually. It lists the values that dealers would charge for different coins. It covers everything from colonial to gold coins and commemoratives. There’s a lot of good, basic information on colonial coins in the front of the Red Book. And it’s inexpensive. Whitman has also published a book by David Bowers called “The Encyclopedia of Colonial Coinage.” It deals with nothing but colonial coinage and has more information on this topic than exists between the covers of any other book. Currency also circulated during colonial times. This one bears the signature of John Hart, who also signed the Declaration of Independence. Books are valuable for the information, but the values listed for coins are often out of date by the time they hit the stands. Prices fluctuate with the economy, and there are many other factors affecting why a coin’s price might change. A coin might go for big money at an auction, which could raise the value of the coins in your collection. A hoard of coins might be discovered and something that was traditionally rare could become more common. With colonial coins it’s impossible to collect everything, but if you figure out what you can afford and just collect that one area, there are specialized books for almost every area of colonial coinage. There are also auction catalogs that precisely describe coins with a lot of historical information. Recently Stack’s in New York City sold the collection of John Ford, and a complete collection of those auction catalogs is a great reference on colonial coinage. I’ve purchased a number of coins from those auctions—they’re some of the nicer coins in my collection. C4 has an annual auction every November along with an auction catalog with many coins pictured and described. Those are collectible and a good research source. There are still a lot of books from the 1800s that are of significant importance to collectors today. They’re not outdated. Colonial collectors and dealers are probably the best-educated collectors in the hobby. They’ve done the most personal research and have fun doing it. Collectors Weekly: So joining a club is pretty important, especially for new collectors? Williams: Whether you are a novice or an advanced collector, joining a club adds tremendously to your enjoyment of the hobby. You’ll receive newsletters that will keep you up to date with the hobby and give you contacts for authors. Some clubs have lending libraries, and there is nothing like a club that has meetings and events where you can meet other people with the same interests as you. I’ve made many good friends in the hobby. C4 is the specialty club for collectors of American colonial coins. Most other numismatic series have a specialty club associated with them, too. If you have a specialty, I think it’s important to seek out people who have the same interests and join them. Kevin was kind enough to email me a picture privately. He found a nice example of a 1787 CT Copper. The particular variety is known as the Horned Bust Variety, due to the progressively enlarging die break in front of the bust (resembling a horn. This is one of the more common varieties of CT Copper. Again, congratulations on finding one of our State Coppers using your metal detector. RAY , THINKING OF JOINING , YOU WANT TO EMAIL ME FORM, WHILE TOO BUSY TO ATTEND OUT OF NEW YORK CONVENTIONS, I WOULD LIKE TO LOOK THROUGH PUBLICATIONS. i AM A LONG TERM COLONIAL COLLECTOR AND HAVE ATTAINED QUITE A COLLECTION OVER THE YEARS. I COLLECT A VARIETY OF TYPES AND HAVE ABSOLUTELY NO INTEREST IN DYE VARIETIES. AM ALWAYS ON THE LOOK OUT FOR ADDITIONAL RARITIES OF TYPE . PERHAPS IF YOU COME TO NYC AREA WE CAN TALK FURTHER . ( EVER GO TO WESTCHESTER SHOW ) . THANKS . Can anyone tell me exactly where the Massachusetts mint was located? Kevin, Which MA Mint are you referring to? If it is the Mint where Hull @ Sanderson struck the MA NE, Willow, Oak & Pine Tree coinage, then it is at the present day location of Macy’s Department Store in Boston. Several years ago a commemorative marker was placed on the side of Macy’s commemorating the Mint. Now if you are looking for the location of the Mint that struck the MA Coppers… Mike Packard just gave an excellent presentation on the topic. He’s the recognized expert on MA Copper coinage. I don’t know enough about Boston to give you his approximate location. If this is what you wanted to know, you can borrow the DVD of the talk from the ANA Library (free to ANA Members) or I can contact Mike and get back to you with the location. Hope this helps and anyone can contract me about colonial coins at njraywms@optonline.net. My knowledge of numismatics after 1792 is limited and I know nothing about these bars you question. If you don’t find an answer, I’d send an inquiry to the curators at the ANA & ANS. Maybe one of them can help or place you in the right direction. Congratulations on your finds! I suspect that if your coins are copper, the first two might be William III Halfpence and the third might be a George I Halfpenny. If the fourth coin is copper, I suspect the fl;eur de lis is a counterstamp. Counterstamps were sometimes used to give a coin a different value than the one it was struck as. The counterstamp could also be a sign of value given to a coin that is circulating where it was not meant to circulate. If you would be able to send me images of these coins, the diameters and metal content, I could give you a more accurate description of what you have. From the standpoint of a fully-decimal coinage system it’s an historical oddity that we have quarters instead of 20¢ coins. As the author noted, a 25¢ denomination was needed to maintain compatibility with the “bits” into which reales were cut. By the time Spanish coinage was demonetized in 1857 the quarter was fully ingrained in the US system, so it remains the workhorse denomination after 2 centuries. I’m sorry I don’t check more often. I didn’t know there’d be this many replies. In any case, if you read this and you’re still wondering about the coin, please email a picture and I’ll see what I can do. I’m willing to try to help anyone with a colonial numismatic question. Would like to join the club. Most interested in Mass silver coins 1652/1662. I see lots of halfpennies on ebay that are listed as real colonial coins. One such guy that sells lots of colonial coins is from Europe. The coins he sells look pretty good and I’m thinking they are “colonial era” British halfpennies. How can anyone tell if a British halfpenny was used in the colonies? Of course, an ad thats lists a halfpenny in this way will bring more money at auction on ebay. The problem is, new coin collectors like myself are being taken every day. Is there any way to determine if a British halfpenny was used in the colonies? Ohan, British Halfpence of all types and dates circulated in the British American colonies. Both genuine coins and counterfeits. The only way to tell for sure if one of these circulated here would be if it was excavated here, or used as an undertype for a state copper. In general, purchasing a halfpenny would be obtaining a type of coin that circulated here. There are counterfeit coins associated with Machin’s Mills in NY that definitely circulated here. Many of the 1749 dated farthings and halfpence were shipped to Boston and the likelihood of purchasing one as an actual coin that circulated here is excellent. “ ” To a Joe Sixpack like me, a match is a match.